The National Weather Service office in San Diego says to be prepared for high surf this weekend. A storm moving into Southern California and its associated large swell will generate areas of high surf at the beaches Sunday. Hazardous swimming conditions are expected. Localized beach erosion or flooding are possible. Swell and surf will subside Monday. The advisory is for San Diego County coastal areas and Orange County coastal areas, and will remain in effect from Saturday afternoon through late Sunday night. 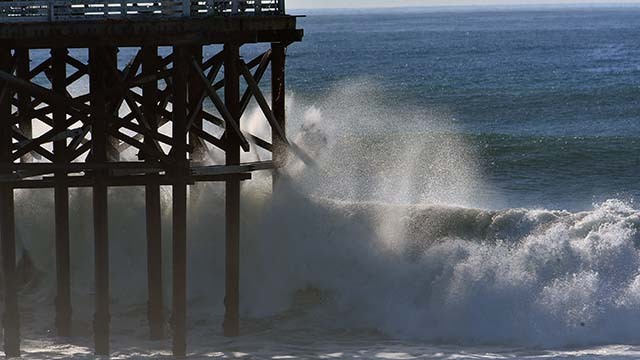 Expect waves and surf to be between 4 to 6 feet in Orange County; 5 to 8 feet with sets to 9 feet in San Diego County. Strong rip currents, hazardous swimming conditions, localized beach erosion and coastal flooding possible. A beach hazards statement is issued when threats such as strong rip currents, elevated surf heights, minor tidal overflow or lightning are possible at local beaches. Obey posted warning signs and flags and talk to a lifeguard before swimming. Use caution when in or near the water and always swim near a lifeguard.